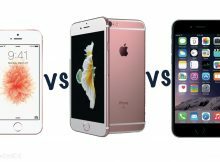 Apple iPhone SE vs iPhone 6S vs iPhone 6: What’s the difference? Apple finally announced a new 4-inch iPhone, following months and months of rumours. The iPhone SE was unveiled at an event in Cupertino in March and it replaces the existing iPhone 5S. 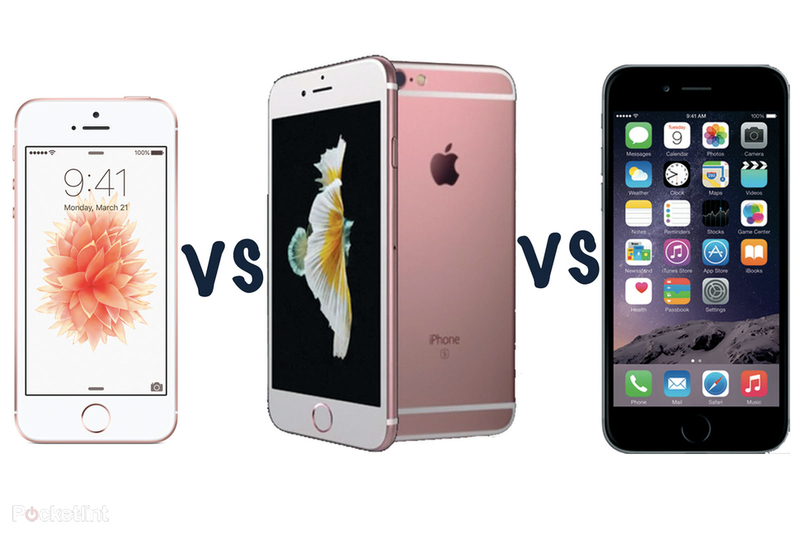 For those wondering how it compares to the larger iPhone 6 and iPhone 6S, we are here to help. This feature explains the differences and similarities between the iPhone SE, the iPhone 6 and iPhone 6S to help you decide which is the right iPhone for you. The Apple iPhone 6 measures 138.1 x 67 x 6.9mm and weighs 129g. The iPhone 6S measures 138.3 x 67.1 x 7.1mm and hits the scales at 143g. Both offer aluminium bodies and although the iPhone 6S is made from a different metal to the iPhone 6, the design on both models is fabulous. They both offer beautiful curved edges, slim builds and there isn’t a single sharp edge in sight. A fingerprint sensor sits within the Home button on both, but the iPhone 6S has the second-generation of Touch ID, which is a little faster than the iPhone 6. The iPhone SE on the other hand, takes the majority of its design cues from the iPhone 5S, but with a couple of changes, including matte edges. It’s smaller, more compact and more pocketable than the iPhone 6 and 6S, and it opts for flat edges over round, as well as a lighter build of just 113g. An aluminium body is featured here too so you don’t lose the premium appeal, while its measurements sit 123.8 x 58.6 x 7.6mm, making it a little thicker than the iPhone 6 and iPhone 6S. It offers Touch ID, but it’s the same technology as the iPhone 6, rather than the second-generation found on the iPhone 6S so it won’t be quite as fast as the 6S. The iPhone SE is offered in the same colours as the iPhone 6S however, with silver, space grey, gold and rose gold all available. The iPhone 6 only comes in silver and space grey colour options. The Apple iPhone 6 and iPhone 6S both have 4.7-inch Retina HD displays. Both their resolutions sit at 1334 x 750, delivering pixel densities of 326ppi. The only difference between the two devices is the iPhone 6S has 3D Touch, which is Apple’s version of a pressure sensitive display allowing for different actions based on the force with which you press. It’s a great feature, but it does require you to reprogramme the way you use your iPhone. The iPhone SE offers a smaller 4-inch display, appealing to those who don’t want a larger smartphone. Those who have stuck with their iPhone 5S or iPhone 5C. The resolution is the same as the iPhone 5S, which puts it at 1336 x 640. Because of the size difference, it means the iPhone SE still offers a pixel density of 326ppi like the iPhone 6 and 6S however, meaning ample sharpness with no softness or blur to images. The SE doesn’t offer 3D Touch, but its biggest issue to is trying to cram everything onto its smaller display now that the iOS software has evolved. The 4-inch display will probably feel small to those that have used a larger device, but it is great for one-handed use. The Apple iPhone 6 offers an 8-megapixel rear camera with 1.5µm pixels and an aperture of f/2.2. It is capable of 1080p video recording and there is a True Tone flash on board. The front camera is 1.2-megapixels, also with an f/2.2 aperture and both are great performers. The iPhone 6S takes things up a notch in the camera department offering a 12-megapixel rear snapper with 1.22µm pixels and a f/2.2 aperture. Video recording capabilities increase to 4K and the True Tone flash remains intact. The front camera also sees a bump to 5-megapixels and while the aperture remains at f/2.2, it comes with a Retina flash. Like the iPhone 6 over the iPhone 5S, the improvements are clear with the iPhone 6S compared to the iPhone 6. We found the iPhone 6S performs as well as many compact cameras we have come across, producing images with natural colours and tones. The iPhone SE opts for the same 12-megapixel rear sensor as the iPhone 6S, meaning it is capable of 4K video recording and Live Photos. It also means you get a fantastic camera in your pocket and it’s a big leap from the iPhone 5S. There is a 1.2-megapixel front camera with an aperture of f/2.4 however, so it doesn’t take from the iPhone 6S here, aside from also offering a Retina flash. The lower resolution is evident in the performance, with images a little soft and lacking in detail. The Apple iPhone 6 comes with the A8 chip and M8 motion co-processor, supported by 1GB of RAM. It is thought to have a 1810mAh battery on board and it is available in 16GB and 64GB storage options. It’s more powerful than the iPhone 5S, as you might expect and it offers great graphics. In terms of battery life, you’ll get around a day with normal use, but the Low Power Mode will help squeeze a few extra hours. The iPhone 6S has a newer and faster chip on board with the A9 and M9 motion co-processor, supported by double the RAM at 2GB. It is faster than the iPhone 6 and as we mentioned previously, Touch ID is also quicker to respond. The battery is said to be 1715mAh, which is a little smaller than the iPhone 6, but we found performance is actually better than the iPhone 6. The iPhone SE features the A9 chip and M9 motion co-processor like the iPhone 6S so as with the iPhone 6S, performance is great. There is 2GB of RAM and a battery capacity of what is thought to be 1642mAh, making it just shy of the iPhone 6S. We managed to get to 10pm with 20 per cent of battery left so the iPhone SE doesn’t do too bad. Apple Pay is supported on both the iPhone 6 and iPhone 6S but it wasn’t on the iPhone 5S. The iPhone SE also supports Apple Pay so no differences between big and small there. The Apple iPhone 6 and iPhone 6S both come with iOS 9, as does the iPhone SE. Ultimately, the iPhone SE offers almost the same experience as the iPhone 6 but with the addition of Live Photos. The one feature missing is the double-tap function that allows the top of the screen to be accessible with your thumb but as it is smaller, it’s not really necessary. The Apple iPhone SE has some pretty interesting specs for its €449 starting price. It may look like the iPhone 5S but it has the processing and graphics power of the flagship iPhone 6S, as well as its rear camera, despite being almost €249 cheaper. The iPhone SE is essentially a smaller version of the the iPhone 6S, minus 3D Touch and a couple of other features such as a higher resolution front-facing camera. For those after a smaller iPhone, you aren’t comprising on much and you’re saving on the pennies. Bigger is normally always better, but sometimes great things come in small packages too, which is exactly the case for the iPhone SE.